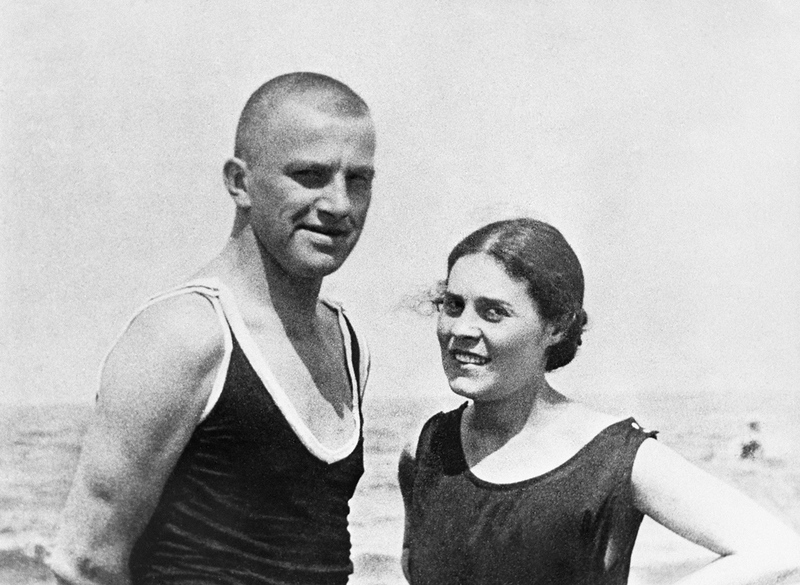 Soviet poet Vladimir Mayakovsky (1893-1930) and Lilia Brik (nee Kagan, 1891-1978) at Norden Zee in Germany in 1922. The private lives of iconic Russian cultural figures are often more interesting than any romantic novel. To celebrate Valentine’s Day, RBTH presents the following five inspiring love stories of self-sacrifice and romantic courtship. The poet's late-life love, editor Olga Ivinskaya, became the prototype of Lara from his Nobel-winning novel DoctorZhivago. The two met in 1946 when she was 34 and a widow with two children, and he was married to Zinaida Neuhaus. Pasternak felt it would be wrong to leave his wife, so he tried to end the extramarital affair several times, but to no avail. Ivinskaya fell victim to Pasternak's complicated relationship with the Soviet regime. She was arrested in 1949 on charges of plotting to flee abroad together with the poet, and spent almost four years in the Gulag. Their romance continued after her release in 1953. Five years later, after Pasternak had been awarded the Nobel Prize, the couple found themselves in isolation as many former friends preferred to cease all contact with the disgraced literary genius. Ivinskaya stayed with him and persevered courageously until Pasternak's death in 1960. The “Poet of the Russian Revolution” first found himself in the house of the muse of the Russian avant-garde in 1915 when he courted Lilya Brik's sister, Elza. Mayakovsky read his poem A Cloud in Trousers, and asked permission to dedicate it to the hostess. The next two years he spent courting Lilya, while her husband took a fancy to the poet’s talent and even published the poem with his own money. Their friendship transformed into a love triangle by 1918. “We all decided to never part,” Brik wrote. This “never” lasted until 1922 when Lilya, exhausted by Mayakovsky's ardor, suggested they take a break. This hit Mayakovsky rather hard, and he would frequently loiter under the Briks' windows, and wrote the poem About That. “I cease to be without you,” he confessed in his diary. Romantic upheavals obviously stimulated Mayakovsky's creative work, and Lilya had no scruples about tormenting her lover for the sake of “good poetry.” Despite the quarrels and disagreements, affairs and the waning of love, they were always close to each other. Mayakovsky mentioned Lilya among his relatives in his suicide note, and she wore until death the ring that he gave her. When the legendary Soviet poet and actor met Marina Vladi her fame was much greater than his. The French star was already globally renowned at age 17 for her role in Andre Michel's film, La Sorciere. Despite her Russian roots, Vladi had not spoken Russian since the age of six. During her visit to the USSR she was taken to the Taganka Theater, where Vysotsky was performing on stage. At the banquet after the performance, Vysotsky kissed her hand without uttering a word, took a seat opposite her, and never took his eyes off her again. “His silence did not discomfort me; we were looking at each other as if we had known each other for a long time,” Vladi recalled. Vysotsky got a divorce, Vladi left her husband, and they got married in 1970. The Iron Curtain, however, would not let them leave a normal family life. Vysotsky was not allowed to go abroad, so Vladi had to keep going to the USSR to see him. She increasingly turned down new roles. When Vysotsky finally got his exit visa and reunited with Vladi, it turned out that the two artistic personalities had difficulty getting along under the same roof. Besides, the poet never managed to overcome his addiction to alcohol and drugs. Vysotsky died in 1980, and Vladi couldn’t reconcile with this loss for many years. The composer met the ballerina at the house of Lilya Brik in 1955. Shchedrin entertained the guests playing the piano, and at the end of the evening he offered Plisetskaya a lift home. There was no continuation to that particular meeting, and the next one took place only three years later, at Moscow's Bolshoi Theater. Shchedrin saw Plisetskaya dancing and fell in love with her, and she with him. He took her to Karelia on a holiday, and after they returned they went straight to the registry office to get married. The registrar wished them to “grow old on the same pillow.” This wish came true, and the couple lived together for 56 years and seven months. Plisetskaya passed away in 2015. When Shchedrin dies, his ashes will be reunited with hers, in accordance with the ballerina's will. The famous conductor and cellist met the soprano at a reception for a foreign delegation, and immediately decided that she would be his. In order to win the married singer's heart, Rostropovich had to employ his creativity and sense of humor. He once gave Galina a bouquet of lilies of the valley in combination with some pickled cucumbers, of which the singer was a fan. Another time, while taking a walk in the park, he threw his light-colored raincoat onto the ground to let Vishnevskaya walk without dirtying her feet. Vishnevskaya's new love proved stronger than her existing marriage. One day, she sent her husband on errands, packed her things in a hurry, and eloped with Rostropovich. Their marriage lasted 52 years, until the musician's death in 2007.